After beating the Los Angeles Lakers three times this season, the Los Angeles Clippers are headed towards a lot of firsts in their franchise history, but the most important thing is that Chris Paul and Blake Griffin now control the NBA scene of the town, while the crumbling, shiny project from across the street is going down with the Kobe Bryant and Dwight Howard relationship. The Clippers have never won the division title, but they’re quite close to their first. They’re 39-17, 5.5 games ahead of the Golden State Warriors and believe it or not, 13 games ahead of the Los Angeles Lakers. They haven’t won the season-series with their crosstown rivals since the 1992-1993 season, when they took three of five games. In less than two months, they have a chance to sweep the season series 4-0, something that hasn’t happened since 1975, when they weren’t even playing in Los Angeles. 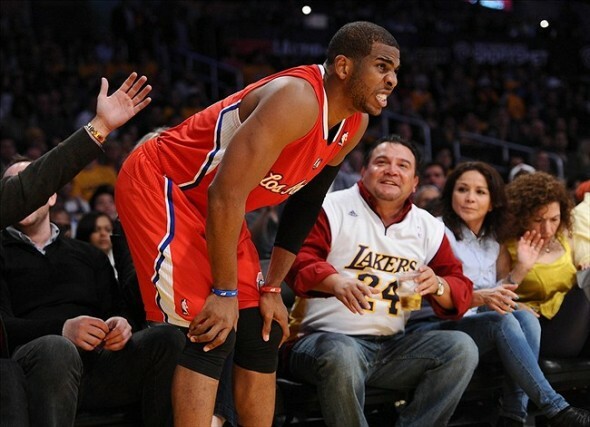 The Clippers opened their latest decimation of the sad Lakers with a 15-0, never looking back. They won 125-101, as Chris Paul, taking a bit of a rest against the Rockets on the previous night, knew what he was saving his energy for. Paul led the Clippers with 24 points and 13 assists, simply tormenting Steve Nash and Steve Blake, as the Clippers made a mockery of the Lakers defense, hitting 16-30 from beyond the arc, dominated the boards and won the turnovers battle as usual. The entire Lakers defense focuses on the ability of Dwight Howard to make up for what they don’t have around the perimeter. With Kobe Bryant it’s not only a matter of effort; he simply can’t be a lockdown defender every game; he just doesn’t have the stamina. Howard is an injured bird with a clipped wing, or simply not a very motivated one. Griffin and DeAndre Jordan had their way with him all night, while Howard didn’t get any help. Griffin scored points and added 10 boards; DeAndre Jordan also had a double-double with 11 points and 10 rebounds. The Clippers look like a team; the Lakers don’t. Their defense is a mess, falling for every feint and decoy the Clippers presented to them, but pushing three players towards the basket, getting the entire defense to center in the paint time and time again, leaving Paul, Chauncey Billups, Caron Butler and Matt Barnes wide open again and again. The Clippers usually say the mundane things after these games – playoffs, playoffs, playoffs, but it felt this win meant a little bit more. It’s great. It’s important to get these wins, but we’re not really just concerned about just them. I mean, it’s good to be 3-0 against them, but we still have to play them another time, and we still have to play a lot of other teams. This isn’t one of those seasons where it’s going to come down to either us or them. There’s a lot of other teams that are good in the West. The Lakers keep talking about a fresh start, about how the 8 wins in 12 games means they aren’t in such bad shape, but just seeing the energy and interaction between the players, you feel they are not going far this season. They’re 1-9 against the top 4 teams in the West, and the whole rules regarding Kobe Bryant shooting or not no longer exist. Bryant scored 20 points on 7-13 from the field, adding 11 assists. It didn’t matter, nothing mattered, because the Lakers are by far the second best team in the city.